A farmer is pictured at his genetically modified corn crop in Dong Nai Province, located in southern Vietnam, on April 2, 2015. While local consumers and scientists are concerned about the commercialization of genetically modified corn in Vietnam, two companies have received the most important nod to distribute the maize in the country. U.S.-based DeKalb Genetics Corporation and Syngenta Vietnam got the go-ahead from the Ministry of Agriculture and Rural Development on March 18 for the mass distribution of genetically modified (GM) corn and seeds in Vietnam. DeKalb is a subsidiary of the world’s largest seed provider Monsanto, whereas Syngenta Vietnam is a localized unit of Syngenta, a global Swiss agribusiness that markets seeds and agrochemicals. Monsanto is the company that produced Agent Orange, one of 15 herbicides used by the U.S. military as a defoliant in the war in Vietnam, according to its website. GM corn has been genetically modified to be resistant to various herbicides and to express a protein from Bacillus thuringiensis that kills certain insects, according to the U.S. National Corn Growers Association. DeKalb is scheduled to sell the GM corn seed to local farms in the last quarter of this year, according to a company representative. In the meantime, Syngenta was slated to introduce the first batch of GM corn seeds early this month before distributing them countrywide, the company’s technical director said. On Thursday, DeKalb invited nearly 500 farmers in the southeast Vietnamese region to its model crop of GM maize in the southern province of Dong Nai to have first-hand experience of the produce. 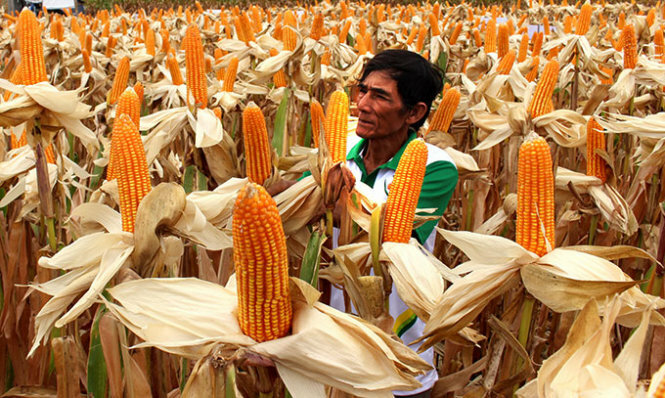 Nguyen Hong Lam, who is selected to grow DeKalb GM corn, said the productivity could be as high as 11 metric tons of dried corn per hectare, comparable to that of the hybrid corn common to local farmers. “But the advantage of the GM corn is that it requires less weed killers and effort to take care of them,” the 64-year-old man added. Farmers have to spray insecticide on their hybrid corn crops twice ten and 30 days after sowing, respectively. “But you don’t have to use pesticide with the GM maize, and only have to spray the weed killer once, 30 days into the crop,” Lam said, adding this helps him save up to VND3 million (US$140) per hectare. Nguyen Minh Tam, who came from the south-central province of Binh Thuan to experience the crop, seems convinced by the features of the GM crops. “I will use this new type of seed for my next crop if prices are reasonable,” he said. The GM maize in Dong Nai is among 100 such crops DeKalb is piloting across Vietnam to calculate the added value the GMO brings to farmers to determine the prices for its seeds. DeKalb is expected to count 25 to 30 percent of the extra value farmers gain from the GM corn into the seed prices, said the company’s director of public relations Nguyen Hong Chinh. The possible health risks GM food poses to humans are still a debatable topic among scientists around the world. But Nguyen Quoc Vong, a professor from Australia’s RMIT University, believes the question as to Vietnam really needs to grow GM maize crops requires an even more urgent answer. One of the biggest concerns for the commercialization of GM corn in Vietnam, according to the professor, is that the country may have to rely heavily on foreign seed providers. Once using GM seeds, farmers are not allowed to use any type of weed killer other than those assigned by the seed providers, otherwise the chemical will kill the crop as well, according to local agriculture experts. “It’s like they sell you beer and insist you drink it with the food they choose,” the experts said. Vuong, from the RMIT University, said the use of GM seeds may also affect Vietnam’s seafood exports. “Any animal that eats GM food is considered a GM animal,” he said, citing the U.S. Department of Agriculture.